Sometimes things don’t turn out the way you’d like and that was the case with our visit to Hager Mountain. 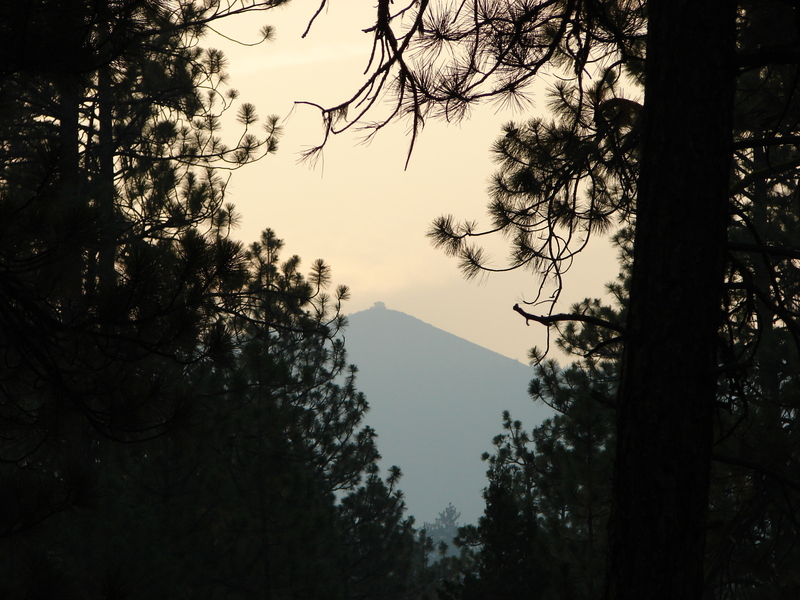 Hager Mountain is a 7195′ cinder cone located in the SE portion of Central Oregon. It’s an area we had yet to explore and were looking forward to a chance to climb up to the summit and survey the area. On a clear day mountain peaks from Mt. Shasta in California to Mt. Hood can be seen. This was not to be one of those days. As we drove southeast on highway 31 toward Silver Lake the sky began to fill with the blue haze of smoke. By the time we reached Fort Rock the Sun, which had just risen, was only a red circle through the haze to the east. We arrived at the trail head in the Fremont National Forest and prepared to start our trek. The faint smell of smoke reminded us of campfires as we set off. Lighting strikes had set dozens of fires in this portion of the State just days before. The trail set off in a forest of Ponderosa Pine and some Juniper. It looked like there should be deer everywhere but the only one we saw was on the drive there. 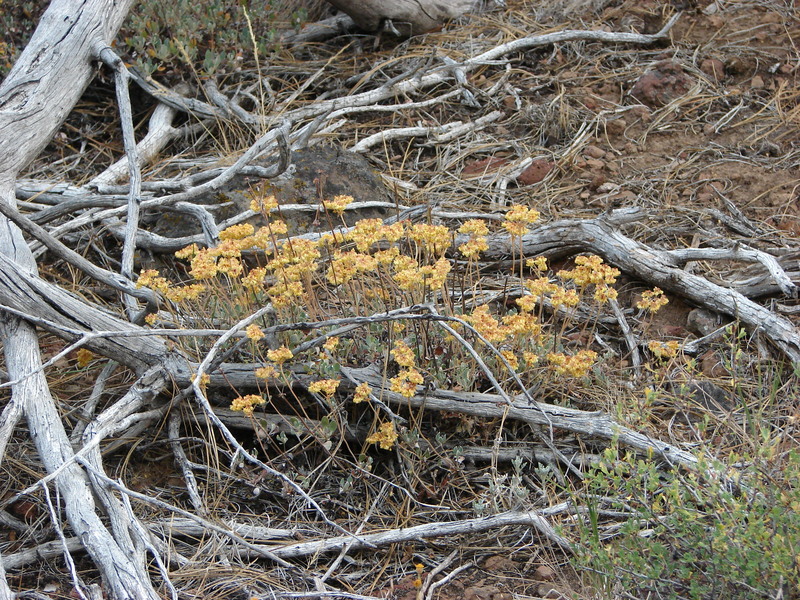 A few flowers were left over from what appeared to have been a good bloom probably in late June or early July. Our first glimpse of the lookout tower gave us an indication of what the view up top was going to be like. Despite knowing we wouldn’t be seeing the views we had hoped for the quiet trail was very nice. It was well maintained and we had it all to ourselves. After a mile and a half we reached Hager Spring. It had an old log fence around it but was dry now. From the spring the trail began climbing a little faster but never too steeply. We passed through various meadows that were full of balsam root and paintbrush but little color remained from their blooms. We were too late for them but the meadows were still pleasant and we had the company of many birds the entire hike. The trail crested and passed briefly through a forested area filled with fireweed and then switched back up through another set of meadows. Suddenly we came around a bend and there was the lookout. Heather and I were both surprised to have already reached the summit because the last time we’d seen the lookout it seemed so far away. 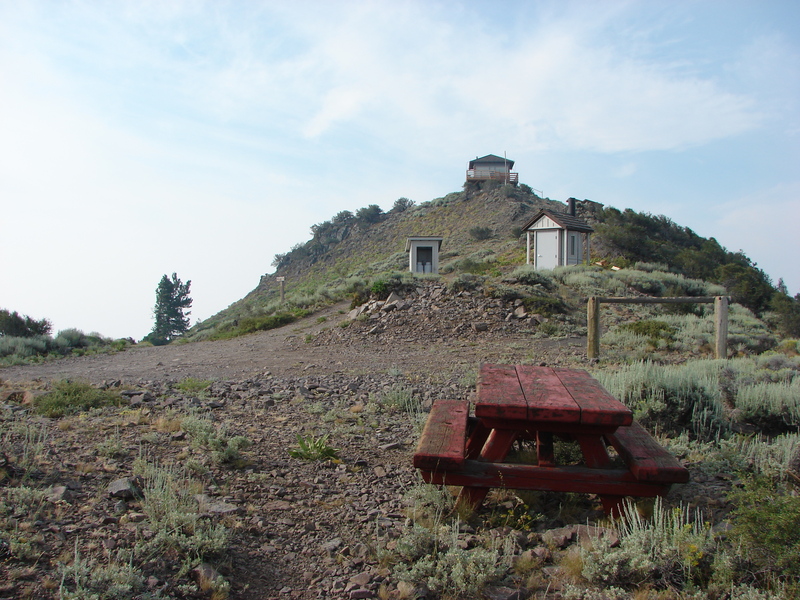 In addition to the lookout tower there was an outhouse and a picnic table. After exploring around the summit a bit we made use of the picnic table to have a snack. It was only 8:45am and we had arrived before the lookout staffer who pulled up shortly after we’d sat down. We at least had some blue sky above us but the smoke surrounded the mountain on all sides leaving us with no views at all. Still it was a nice place to sit and relax a bit before starting our descent. 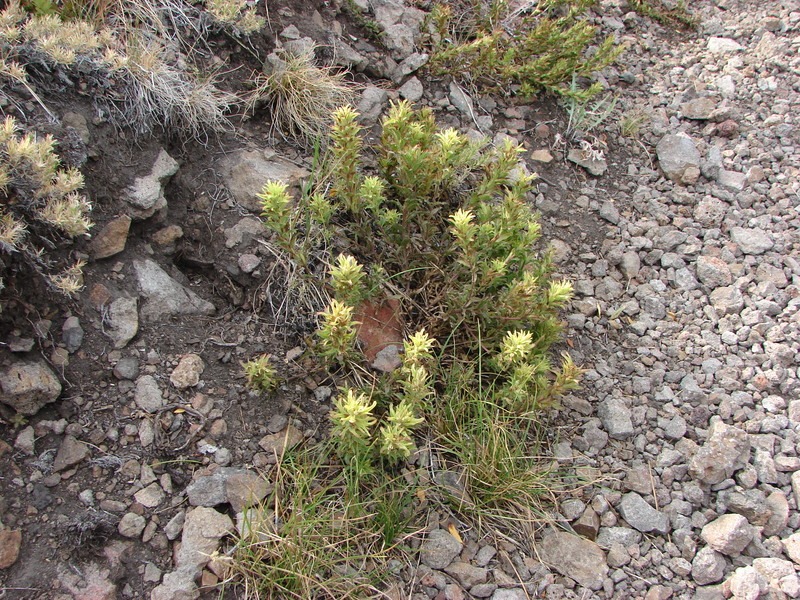 A plaque on the summit told us about green-tinged paintbrush which is native to Southern Oregon and has a very limited range. Apparently 95% of the world’s population is found in the Fremont National Forest. We kept our eyes open on the way down and spotted a few of the plants near the summit. We spotted a lot of wildlife on the way down. Various birds, butterflies, and other insects were all over keeping the hike entertaining. 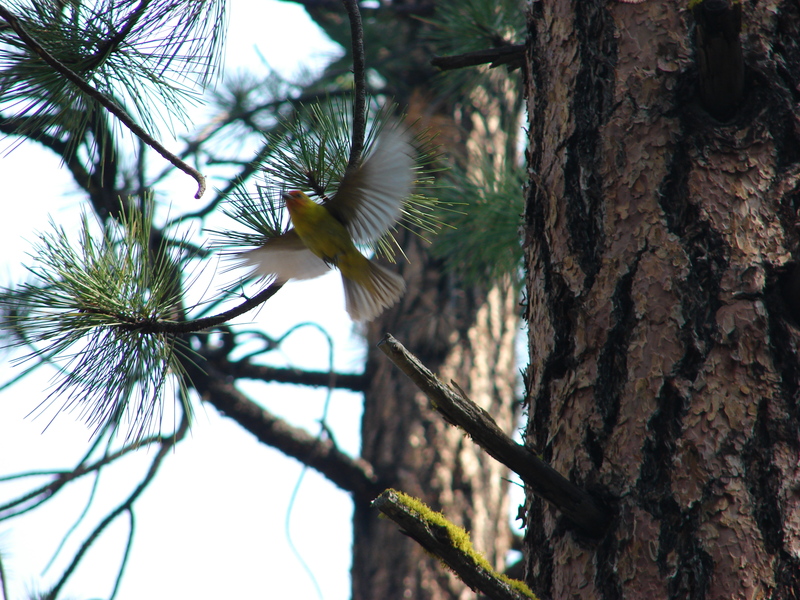 I spent awhile attempting to get a picture of a western tanager who wouldn’t sit still but I finally managed to get a shot of him as he took flight. Despite the lack of views and being too late for the really good flowers the hike was surprisingly enjoyable. We decided that we would definitely be coming back again earlier in the year to try again. What little we had seen told us it would be more than worth the trip. When we got back to our car a series of forest service vehicles and a water tanker truck went by heading for one of the fires. Happy Trails. After finally successfully hiking Canyon Creek Meadows the next day we headed to McKeznie Pass to visit the Matthieu Lakes. We had been in this part of the Three Sisters Wilderness the previous October on a dreary day that left us without any views of the mountains and too late in the year for flowers. We arrived at the trail head at about 6:30am and were quickly reminded of how cold it is in the Cascades early in the morning. Looking behind us from the parking area we could see the spire of Mt. Washington as the morning sunlight reflected off the volcanic rock. We had already seen one more mountain than we had the previous year and we hadn’t even started hiking yet. A short path led to the Pacific Crest Trail which we turned left on and started a gradual climb up to the start of the Matthieu Lakes loop. At the loop junction we kept on the PCT and headed toward South Matthieu Lake. As we climbed the tress began thinning out giving us glimpses to the north and west. The further we went the more we could see and soon a string of volcanoes was lined up on the horizon. 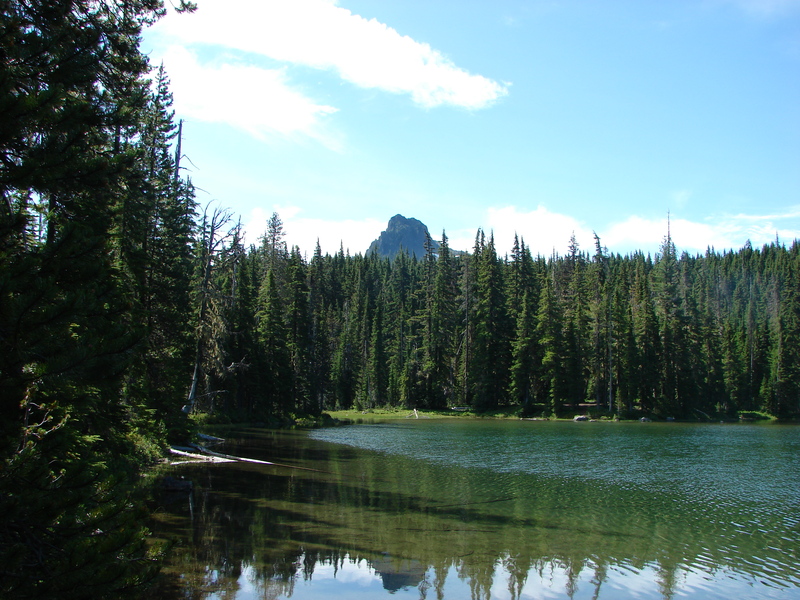 When we reached South Matthieu Lake North and Middle Sister had joined the visible volcanoes to the south. They rose above the small lake making for a pretty scene. At the north end of the lake was a trail junction for the return loop, but first we continued on the PCT heading for the meadow at the Scott Trail junction. In October we had come from the other direction on the PCT and then taken the Scott Trail back to our car and we could see the potential for the meadow to be a beaut at the right time. 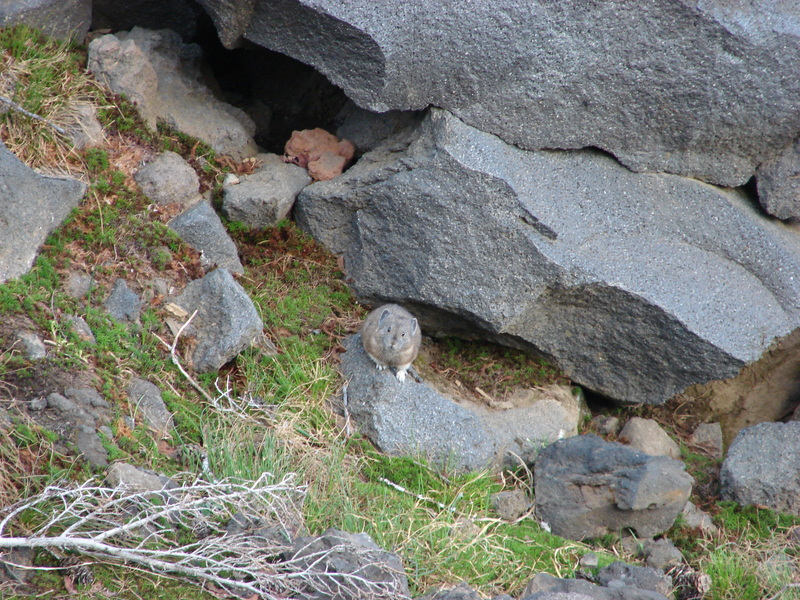 This section of the PCT started along side a lava flow where we spotted a Pika who seemed to be as interested in us as we in it. 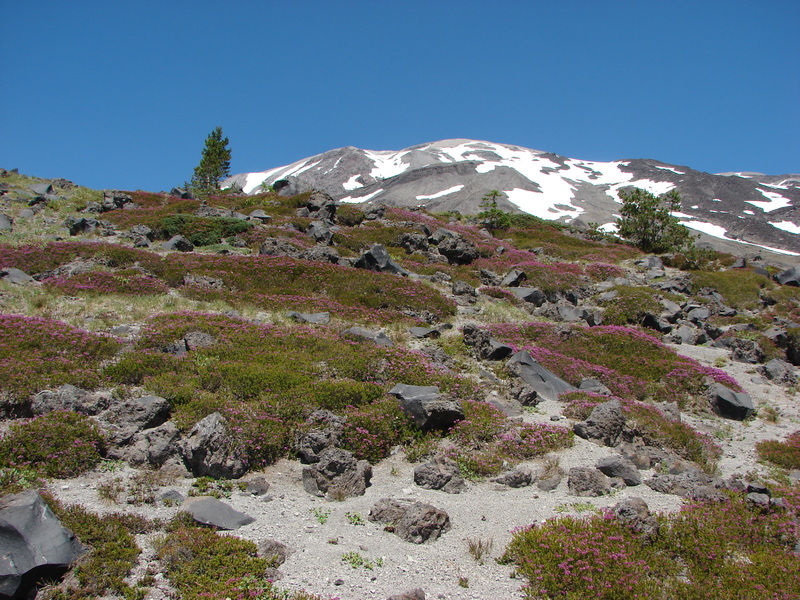 The trail then passed over the lava flow and headed for Yapoah Crater, one of many cinder cones that helped create the volcanic landscape. The Sisters got larger as we neared and to the north the view became even better as we gained elevation. As we contoured around Yapoah Crater we could even see the top of Mt. Adams in Washington join the volcanic line beyond Mt. Hood. Here the crater hid the Sisters, but as we came around they came into view joined by The Little Brother. A short while later we reached a ridge looking down into the meadow. 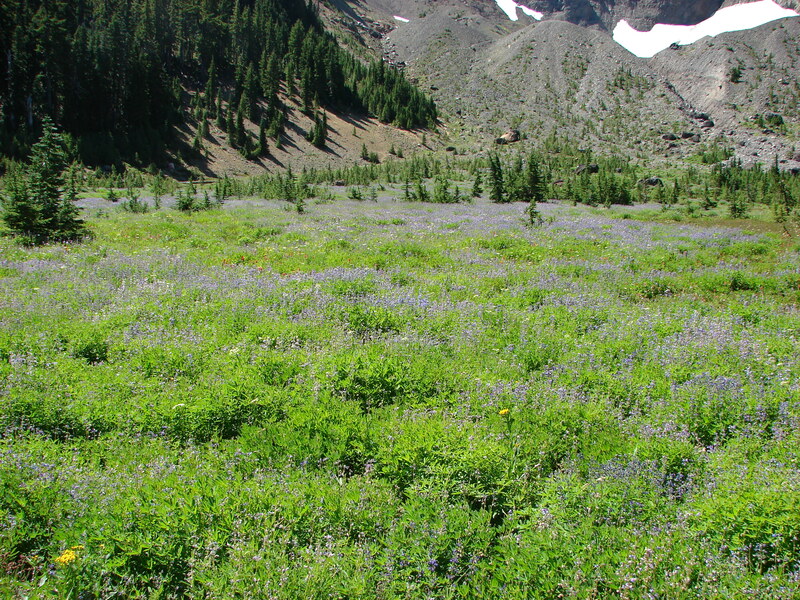 The purple patches of lupine were visible from above and as we descended other flowers became evident. Pink heather, red paintbrush and several different yellow flowers were joined by a single western pasque flower at the meadows edge. Here we also ran into our first mosquitoes of the day but they were not too bad. The meadow itself was filled with flowers and a view ahead to the Sisters. We crossed through the meadow on the PCT enjoying the display of wildflowers. Had the mosquitoes been less it would have been a perfect lunch spot, but as it was we just turned around and passed back through. 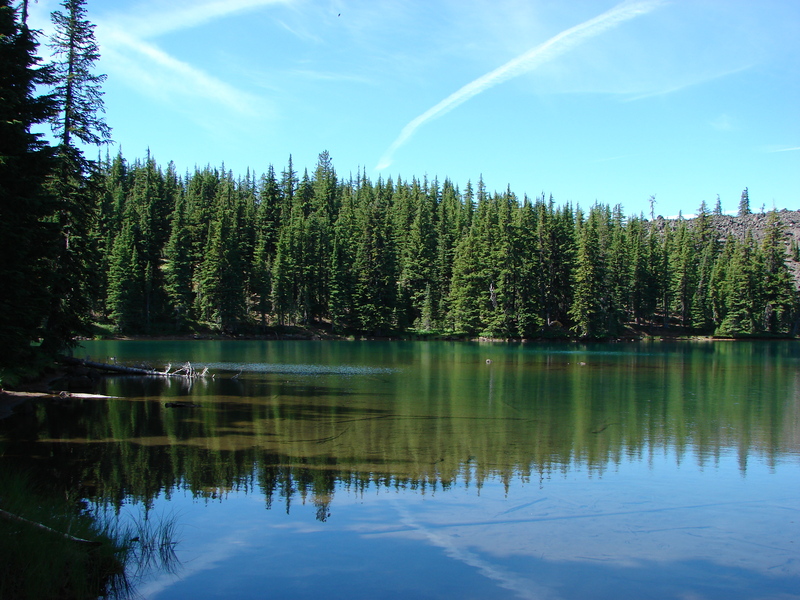 When we reached South Matthieu Lake we took the North Matthieu Lake trail to visit that lake and complete our loop. North Matthieu Lake was much larger than South Matthieu, but being lower in elevation meant almost no view of The Sisters save at the very north end and then only just the tip of the North Sister was visible. What it lacked in mountain view it made up for in color. The water went from blue to green depending on where you looked. Past North Matthieu Lake we encountered a number of small ponds. The last of which was teeming with birds. 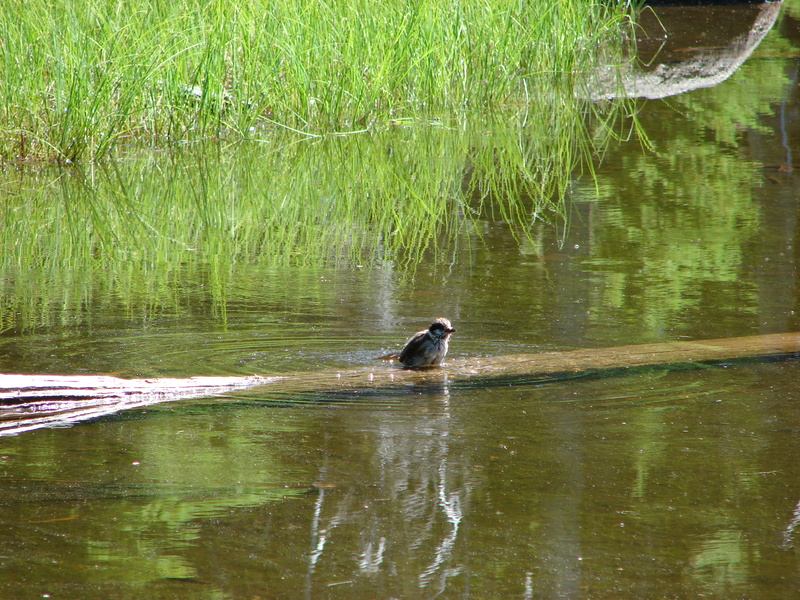 We spotted a variety of birds in the trees around the pond and sometimes in it. 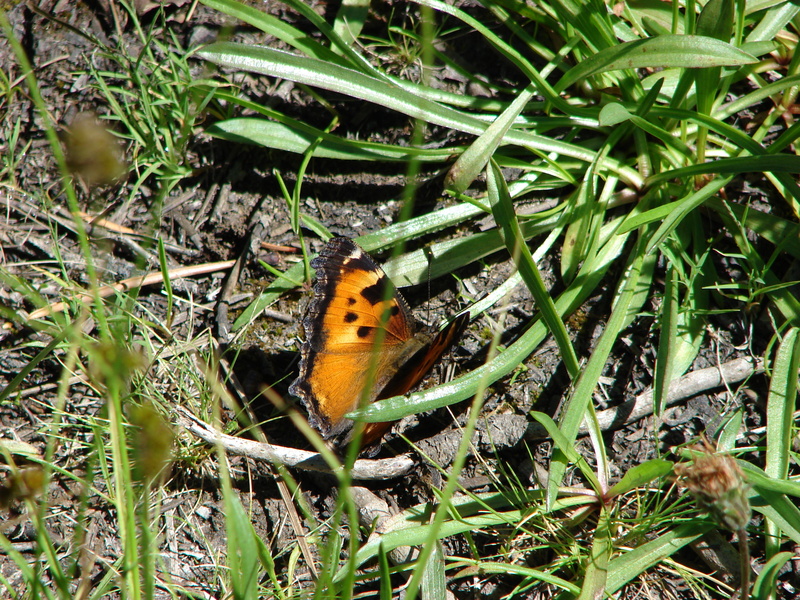 Finally we passed through a small meadow beside a lava flow that was home to a number of butterflies. Here we saw our first California Tortoiseshell. It was a great hike and really nice to be able to visit a place we had been before at a different time. It’s amazing how much timing can change the experience. It was a good reminder that it can be worth going back to a previous hike at a different time of year to see how things have changed. Happy Trails. Canyon Creek Meadows had been a monkey on our backs, or is it packs for hikers? We had tried several times in the past two years to get this hike in and either snow or forest fires forced us to change our plans. We had put it back on our schedule for August 2nd this year hoping this year would be different. Thanks to a very helpful trip report on 7/26 by pdxgene via portlandhikers.org we learned that the meadows were not only snow free but the flowers were in bloom. We were now in danger of being too late for the full flower display so we moved the hike up in the rotation and off we went. 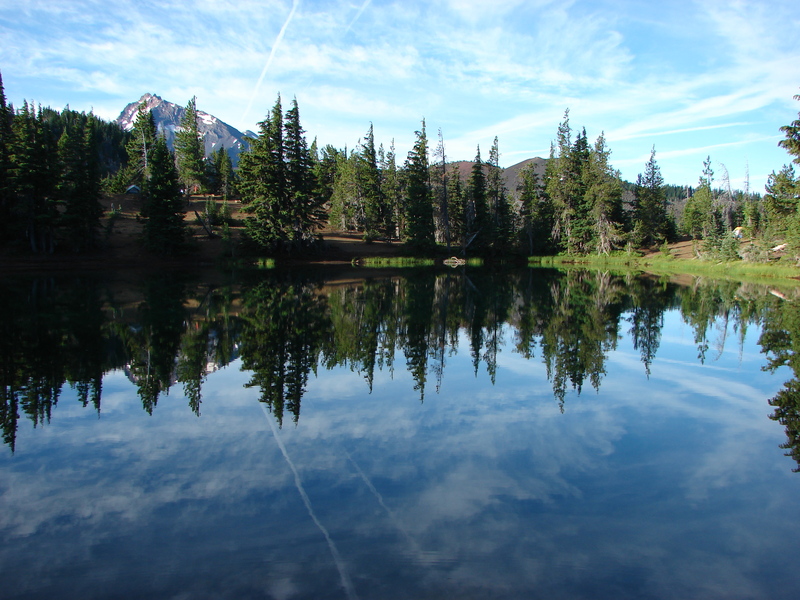 It was a beautiful morning at the Jack Lake trail head and after a minor detour around the wrong side of the lake we were headed for the lower Canyon Creek meadow. The trail alternated between burned and unburned forest as it climbed to the first meadow. The flowers here were still in bloom despite some already feeling the effects of a warm and dry late Spring and early Summer. 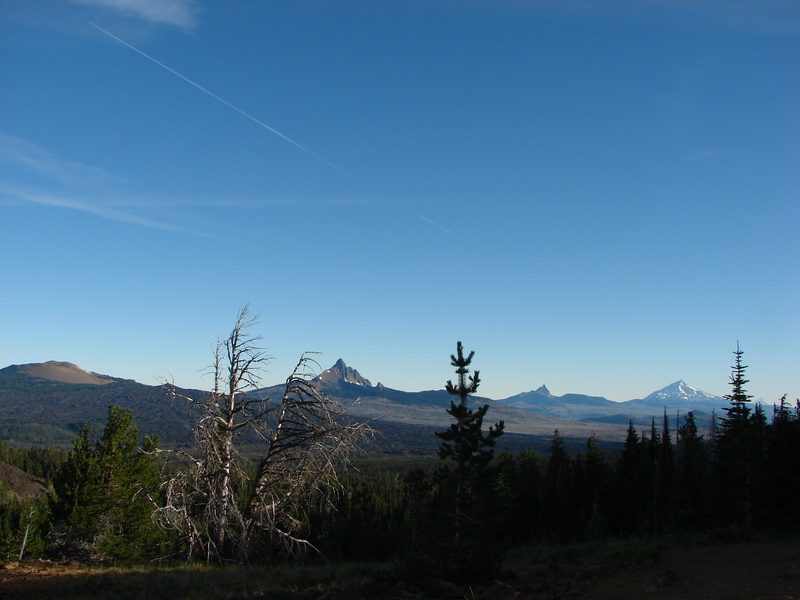 Beyond the meadow Three Fingered Jack filled the horizon beneath a blue sky. 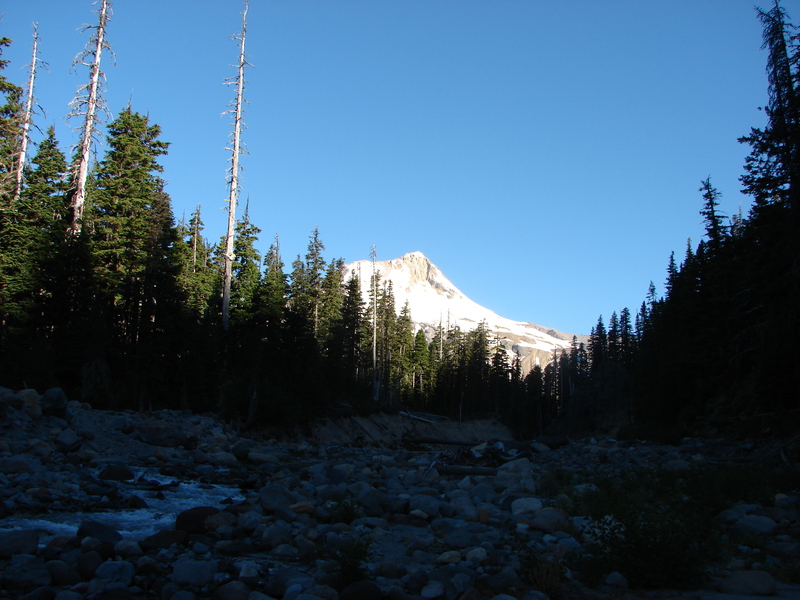 As we continued on toward the upper meadow the views of the mountain got better and better. A near full moon hovered above the summit all morning shifting positions as time passed. 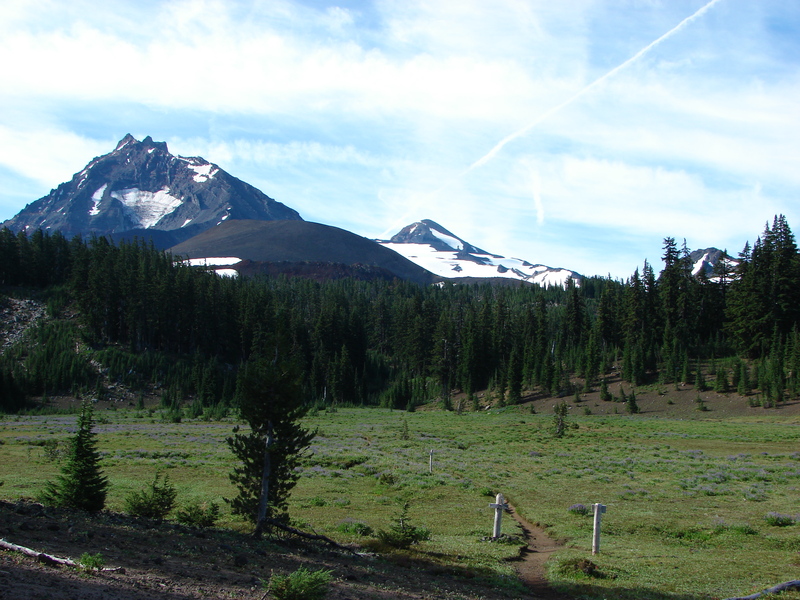 We skirted the edge of the upper meadow and headed up toward a saddle with a view of a cirque lake below a glacier on the flank of Three Fingered Jack. The path was steep with a lot of loose rock but the views were more than worth it, and a healthy wind quickly cooled us off on top of the saddle. We had some food and explored the ridge along the saddle where we found a less steep trail down from the east. In the post on portlandhikers Gene had mentioned that after 12:00 the shadows from the mountain causes issues with picture quality from the upper meadow so we wanted to get back down before we ran out of time. 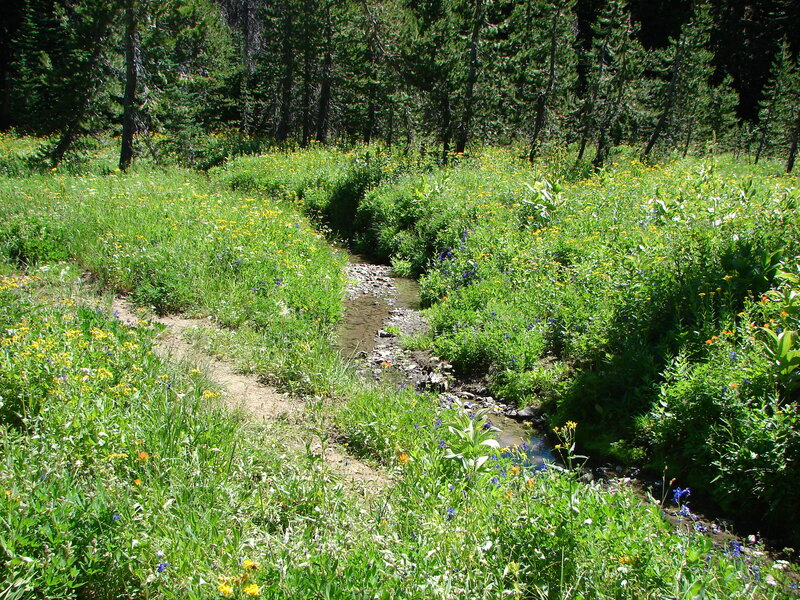 Canyon Creek flows out of the cirque lake through the upper meadow creating a wonderful wildflower display. The lupine was especially thick here. 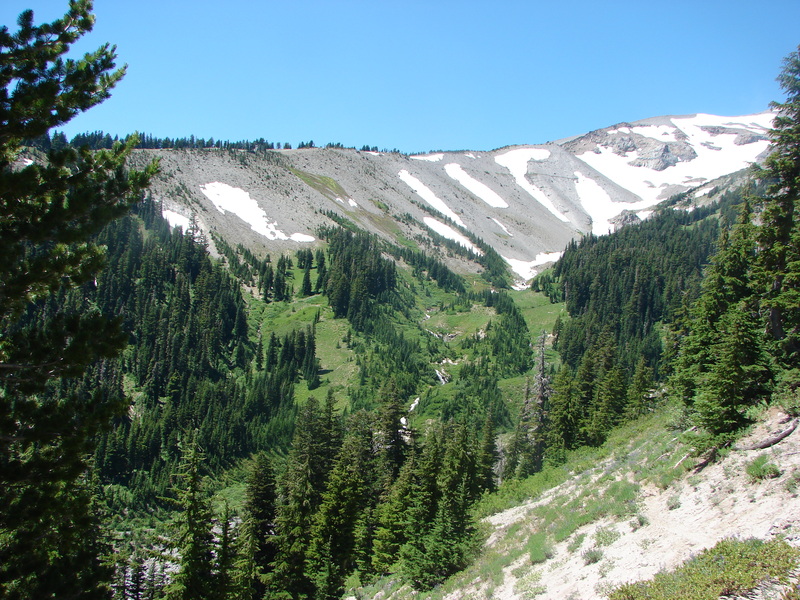 After exploring the upper meadow we followed Canyon Creek down to the lower meadow and began the loop back to the car. (To help control the foot traffic on this popular hike there is a loop that you are asked to hike in a clockwise direction.) Before we got back we took a short side trip to Wasco Lake for no particular reason. It was pretty and quite but we were ready to get back to the car so we took a quick break and finished the hike and removed the monkey from our packs. Happy Trails. Greetings, we recently made our first visit of the year to Mt. Hood. We had taken a handful of trips to the west side of the mountain last year and had fallen in love with it. 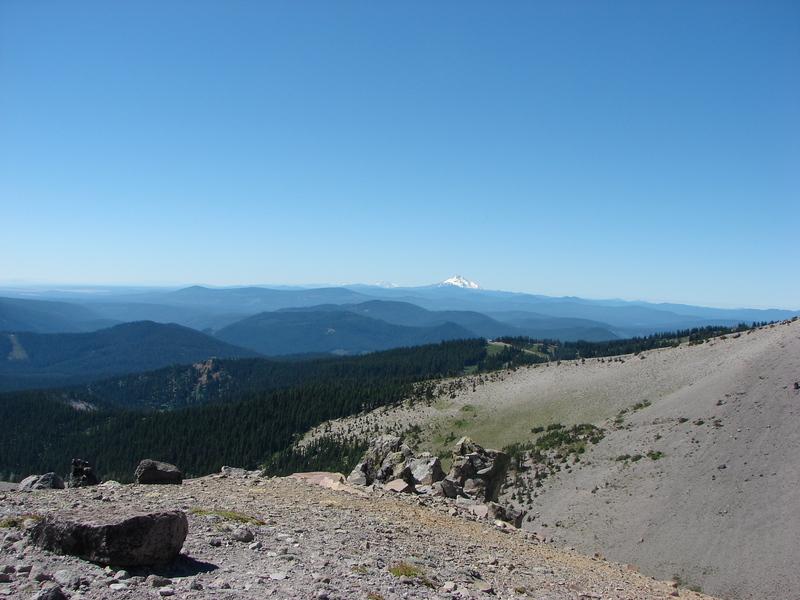 So for this hike we decided to check out the east flank of Oregon’s tallest mountain. The plan was to travel a big loop around the area to hit as many sights as possible. Starting at the Elk Meadows trail head just off highway 35 near the Mt. Hood Meadows ski area the plan was to hike around the far end of the meadow, head up Gnarl Ridge for an up close view, then take the Timberline Trail through Mt. Hood Meadows, and return to the car via the Umbrella Falls trail to visit two waterfalls along the East Fork Hood River. Total planned distance was 15.2 miles (which I verified using two different maps). We set off on the Elk Meadows and soon reached the boundary of the Mt. Hood Wilderness at Clark Creek. After crossing the creek (and into the wilderness) another .6 miles brought us to Newton Creek and a nice view of Mt. Hood. 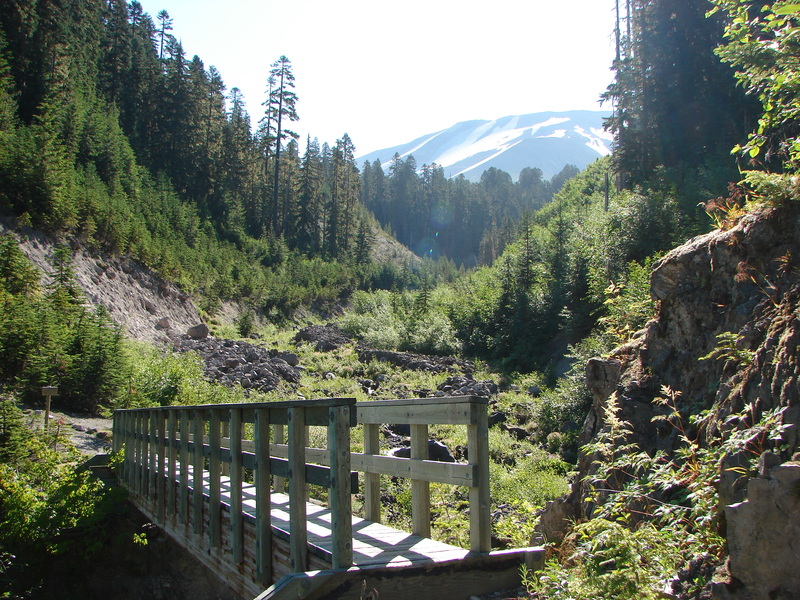 We crossed the creek on a makeshift bridge and began climbing up towards Elk Meadows. Purple lupine began lining the trail as we approached the meadows and soon we could see the open green expanse through the trees ahead. Our arrival was ill timed as it was early on a weekend morning so many backpackers were camped around the perimeter. We did our best to avoid disturbing the campers and skipped a visit to the old shelter, but we still managed to get some good views. We veered off the perimeter trail and took the Gnarl Ridge trail up toward the mountain. After a mile or so we reached the junction with the Timberline Trail on its way around Mt. Hood. 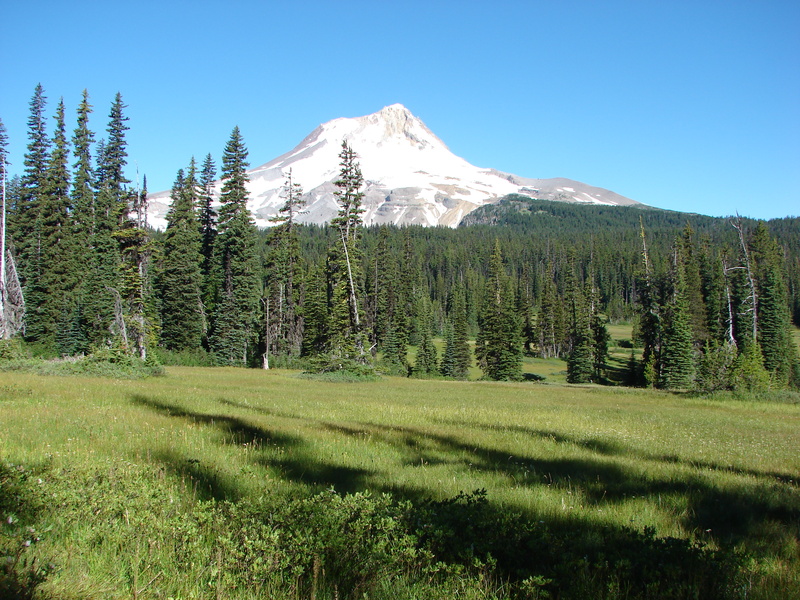 We continued on the Timberline Trail through ever better wildflower meadows as we gained elevation. 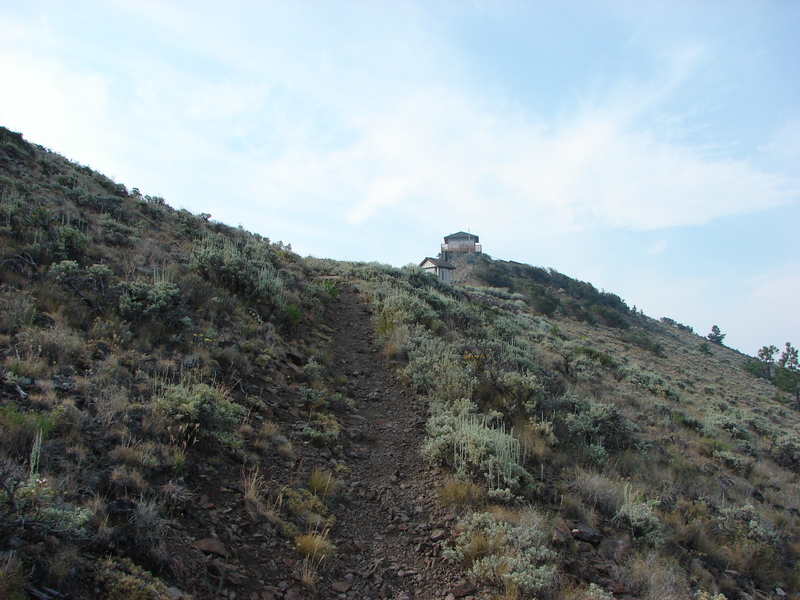 This portion of the trail winds around Lamberson Butte which kept Mt. Hood hidden for awhile. As we worked our way around the butte we spotted Mt. Adams and the very top of Mt. Rainier away to the north. Eventually forest began to give way to sand and rocks as we approached the Gnarl Ridge viewpoint. 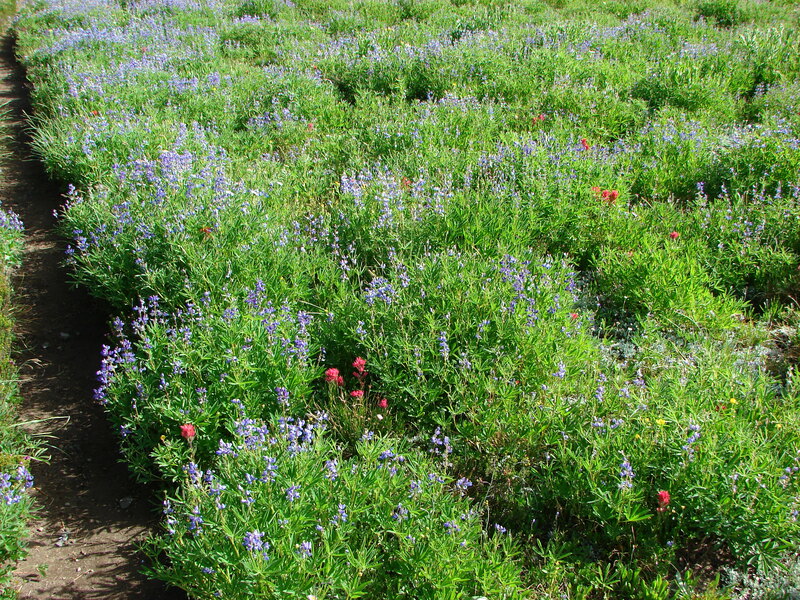 Dwarf lupine and buckwheat dotted the drier ground able to survive in the exposed dry climate. Mt. Hood now loomed before us while the Newton Creek Canyon replaced Lamberson Butte on our left. Behind us to the south snowy Mt. 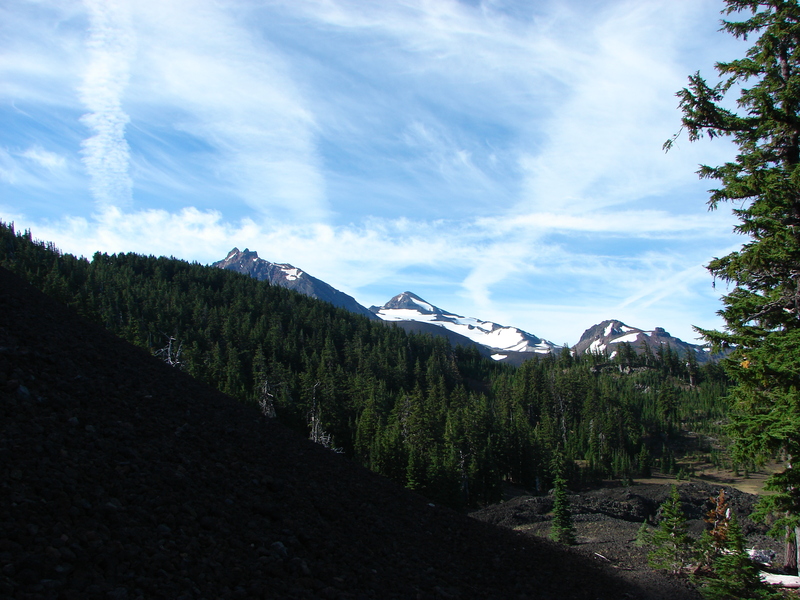 Jefferson was joined by the Three Sisters and Broken Top in Central Oregon. To the SE there appeared to be a fire which it turned out was in fact a forest fire on the Warm Springs Indian Reservation. We had been informed by a fellow hiker we’d run into earlier that there were a couple of waterfalls coming off of snow melting higher up on the mountain, but we couldn’t see them from where we’d stopped. We decided to split up and see if we could get a view so Heather headed further up the ridge while I turned around and scrambled up Lamberson Butte. From the butte I was able to see the falls, the higher of the two seemed to be flowing straight out of the rocks and sand. I could barely make out Heather up on the ridge and decided to go see if she had a closer view from where she was. She didn’t, but she did find a great overlook of Newton Creek as it flowed down through the canyon. 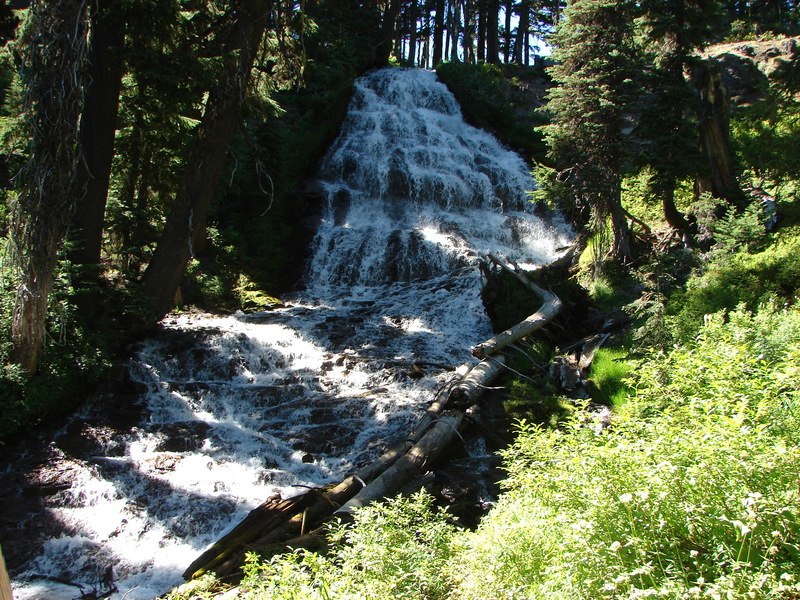 Having found the waterfalls we headed back down the Timberline Trail and headed down into the Newton Creek Canyon. On the way down we ran into Ken, the hiker who had told us about the waterfalls, on his way back up the trail. He had been down to the creek but was uncertain of the correct place to cross and hadn’t been able to spot the continuation of the trail on the opposite side of the creek. I had seen trail reports on Portlandhikers.org from hikers that had made the crossing in the previous couple of weeks so I knew there was one, and between my maps and GPS unit felt confident we could find it. Ken decided to join us and followed us back down to the creek. We wound up using the map, GPS, and binoculars but in the end found two good crossings and Ken quickly spotted the flagging marking the continuation of the trail. At the top of the canyon Ken turned down the Newton Creek Trail to complete his planned loop and we continued clockwise around the mountain on the Timberline Trail. 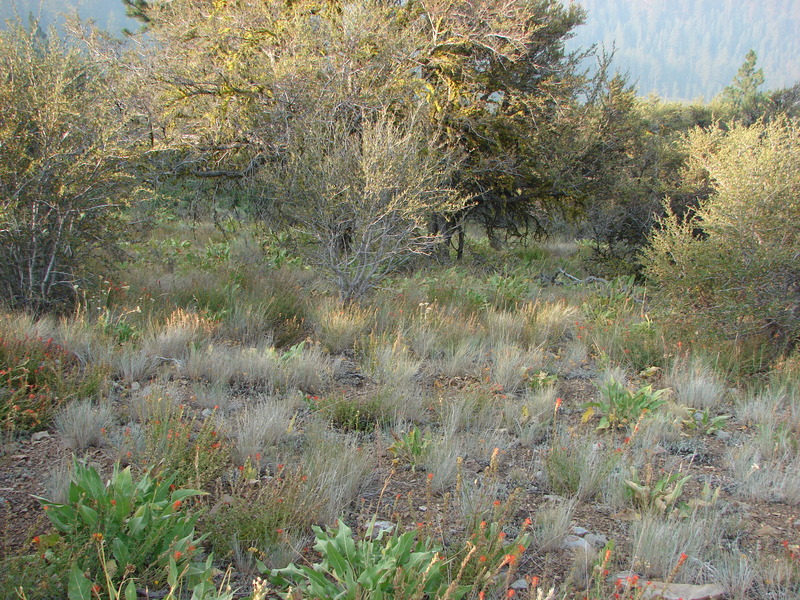 When we reached the Clark Creek canyon the gray sandy ground began to give way to more plants and flowers. We could see down to Heather Creek as it flowed through the canyon on its way to join Clark Creek. The lush valley below was a stark contrast to the bare ridges beyond as Heather Creek flowed down the middle in a series of picturesque waterfalls. We crossed the creek just above a nice waterfall surrounded by beautiful wildflowers. It was certainly one of the prettiest places we’ve been. When we gained the canyon ridge we came to the Mt. Hood Meadows. 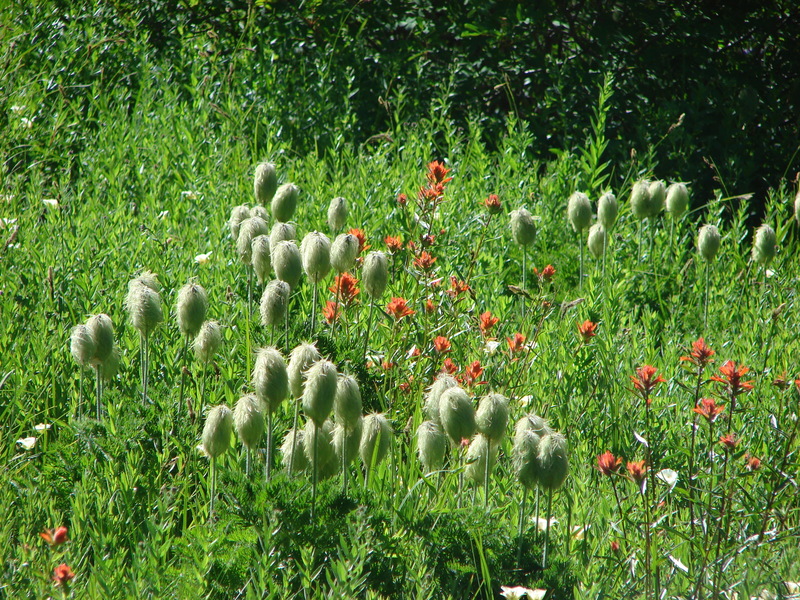 The ski lifts sat idle and the ski runs were replaced with green slopes decorated with wildflowers. As we passed through the meadows we noticed that each one seemed to have a slightly different mix of flowers often with Mt. Hood towering above. One would be cat’s ear lilies and lupine, another beargrass and paintbrush, and yet another of western pasque flowers and paintbrush. This was a treat for Dominique since his favorite flower is the paintbrush but he also enjoys the “Hippies on a stick”. After a little over three miles since saying goodbye to Ken we reached the Umbrella Falls Trail. In 3.5 miles we would be back at our car but first we had some waterfalls to visit. Up first was Umbrella Falls, the trails namesake. We crossed the East Fork Hood River just below this fall which was rather scenic. Normally we would have stuck around for awhile and enjoyed a snack while taking in the falls, but after the unplanned scramble up Lamberson Butte and extra climb up the Timberline Trail it was getting late and we were all pretty tired. We continued on to a sign for Sahalie Falls which was down in a narrow canyon. The trail down was steep and after surveying it I went down alone. This was another nice waterfall and the breeze created by it felt wonderful. After climbing back out of the canyon we completed the final .5mi leg of our loop and arrived at the trail head. Once again Mt. Hood had delivered a spectacular hike. In addition to the mountain views, wildflowers, and waterfalls we saw dozens of butterflies and a pair of Western Tanagers. We have three more hikes planned around Mt. Hood this year and can’t wait to see what else the mountain has to offer. Happy Trails. So after a couple of months of taking pictures of the major Cascade peaks it was finally time to visit one. Our most recent hike brought us to the volcanic landscape of Mt. St. Helens. Our plan was to hike a loop on the SW side of the mountain starting at the Blue Lake trail head. For the second week in a row we spotted elk from the car on the way to the trail, but were skunked while actually hiking. We arrived at the current Blue Lake trail head (washouts occasionally relocate it) and headed across a rocky washout to the Toutle Trail. The washout provided a view ahead to the mountain while forest lined each side. 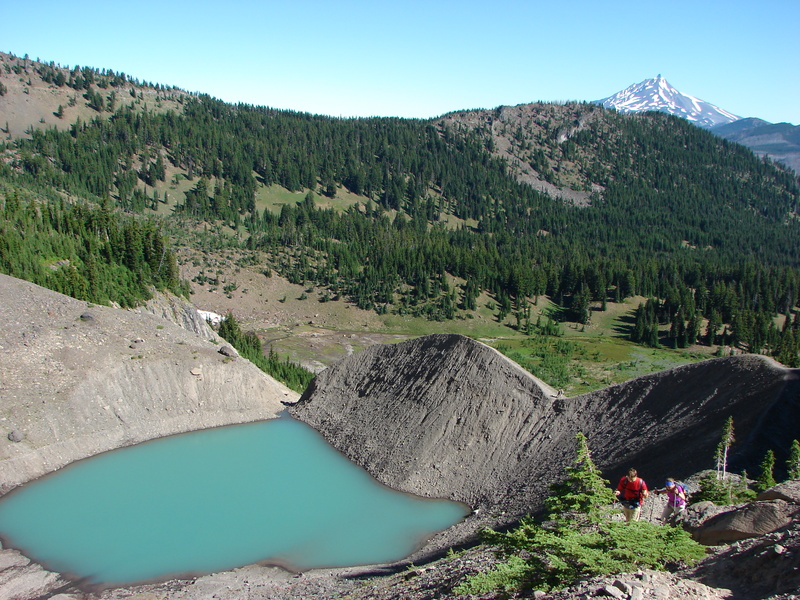 At the Toutle Trail we turned left and headed toward Blue Lake. Coldspring Creek flowed along the edge of the washout creating a dividing line between the grey rocks and old growth forest on the other side. Shortly after crossing the creek and entering the forest we came within sight of Blue Lake. 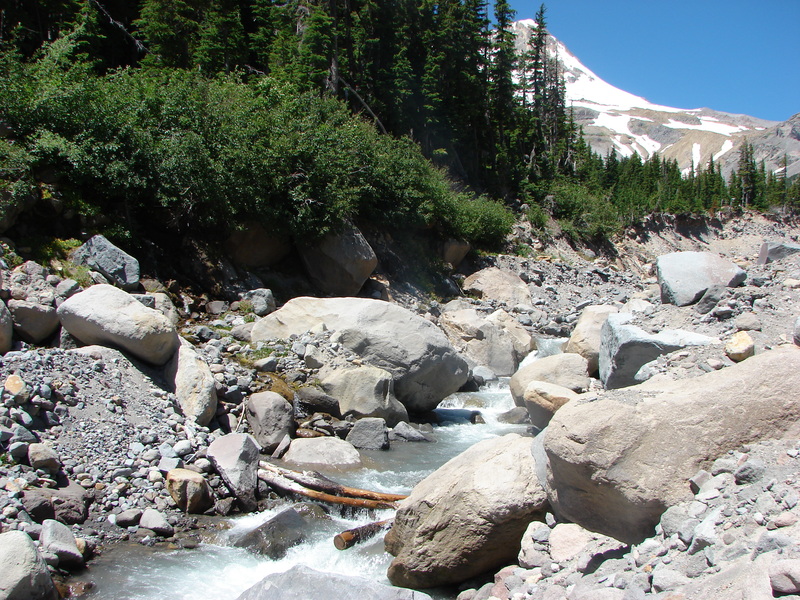 The forest here survived the 1980 eruption leaving old growth trees, but a mudflow dammed the creek creating the lake. The forest was peaceful and carpets of white flowers covered much of the ground. After 2.5 miles in the forest we began to descend into Sheep Canyon. Here the Toutle Trail intersects the Sheep Canyon trail which climbs the mountain on the south side of Sheep Canyon up to the Loowit Trail which circles the entire mountain. We continued on the Toutle and crossed Sheep Canyon on a scenic footbridge and continued on toward the South Fork Toutle River. This section of trail was not very well maintained so we had to do a lot of stepping over and under along the way. After 1.5 miles we made it to the Toutle Trail’s own jct with the Loowit Trail at the edge of the S. Fork Toutle River’s canyon. This wide canyon was affected by the eruption when snow from Mt. 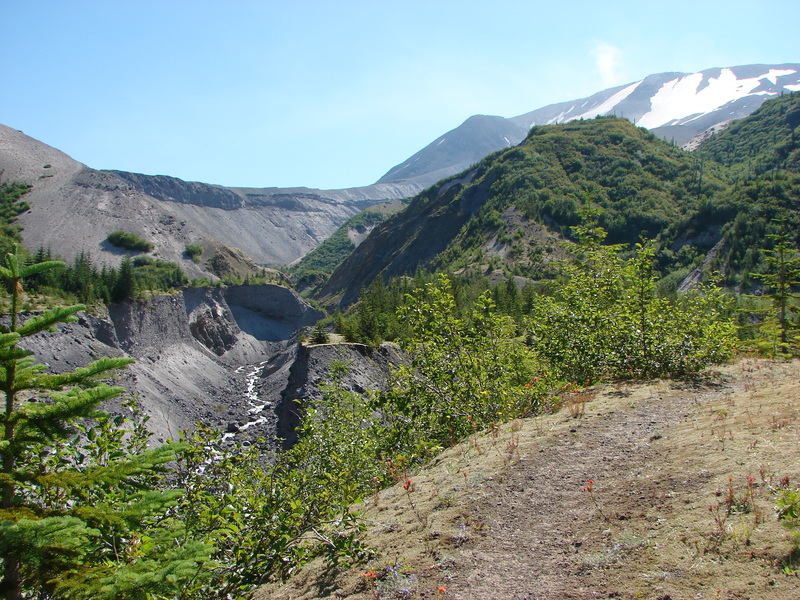 St. Helens’ glaciers rapidly melted sending a huge mudslide down the valley. The river now is a small ribbon of water in the wide canyon. Here we turned right on the Loowit and started to climb the side of the mountain. 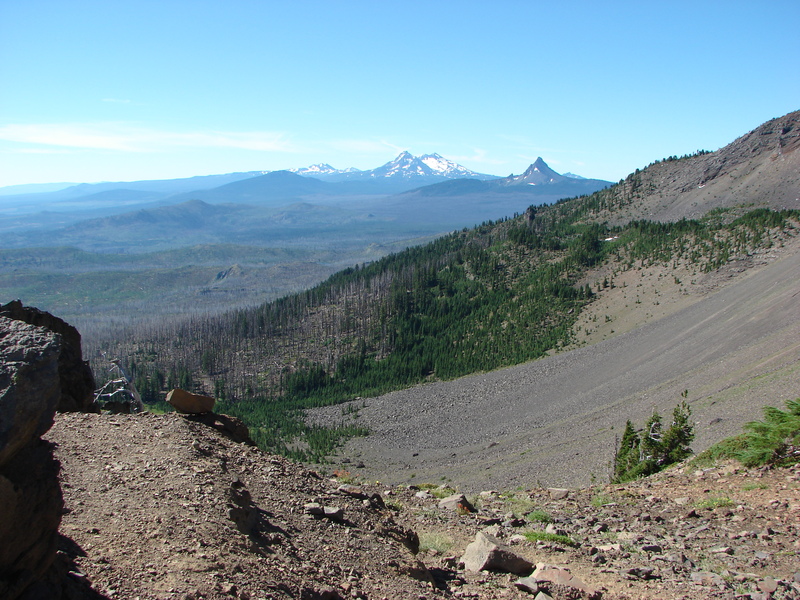 As we climbed we left the forest and entered the blast zone where the trees did not survive the eruption. Here increasingly better views opened up of the mountains rim and to the north the top of Mt. Rainier. Wildflowers surrounded the trail taking advantage of the clearings created by the blast. We passed through some excellent bear grass stands and large numbers of orange tiger lilies, purple penstemon, red columbine & paintbrush, and various colors of phlox. 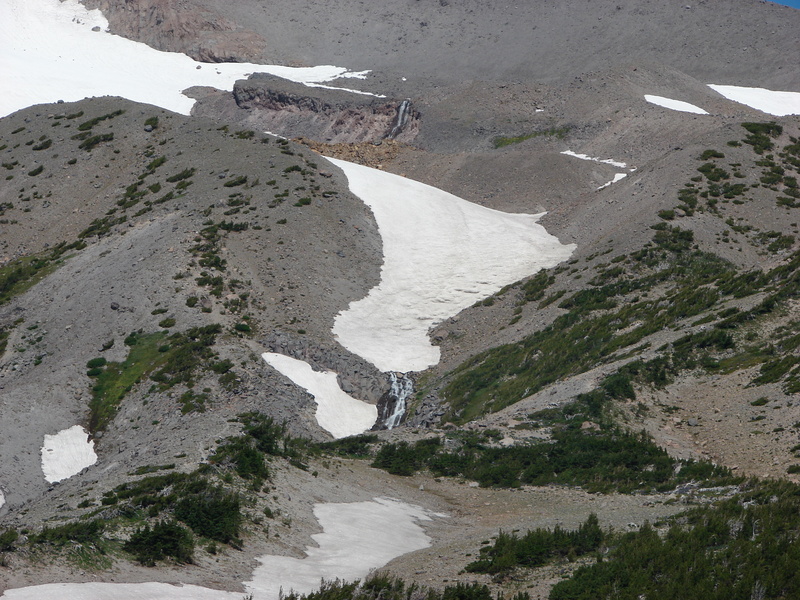 Some small patches of snow lingered in gullies along the way. The trail eventually leveled out and began traversing along the mountains flank to the south. We dipped in and out of the tree line passing a number of different landscapes. We passed the Sheep Canyon Trail choosing instead to continue to the Butte Camp Trail. As we traveled on we crossed several rocky outwash gullies and eventually worked our way far enough around to the south to see Mt. Hood and Mt. Jefferson in the distance. Pink mountain-heather and dwarf lupine bloomed along this portion of the trail. 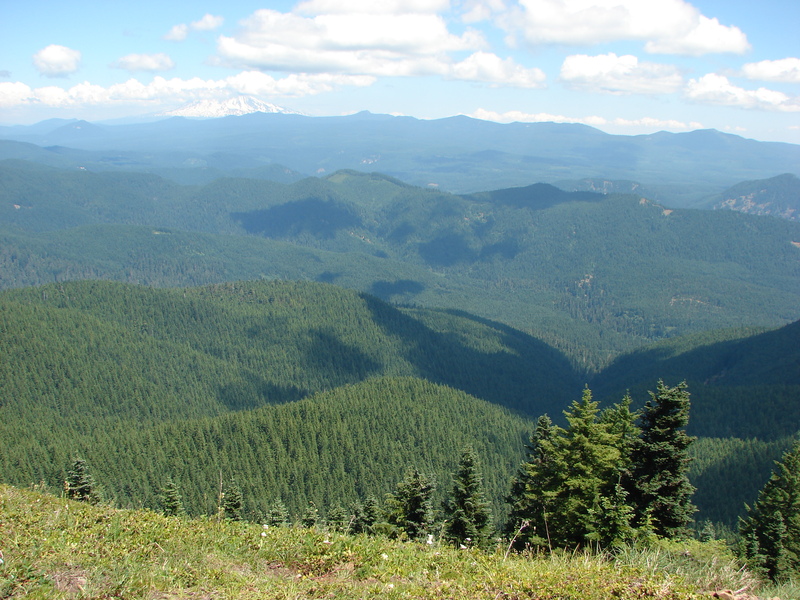 When we reached the Butte Camp Trail we turned right and started our descent back to the Toutle Trail. 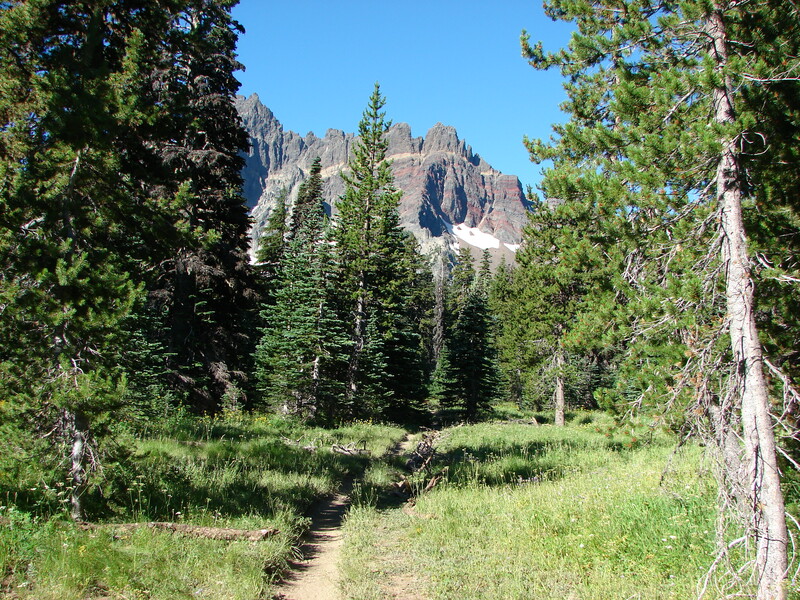 This trail passed through a dry lodgepole pine forest before reaching the meadow at Butte Camp. Recent snow melt had left the meadow flooded. The trail got us down fairly quickly without being steep and soon we were back on the Toutle Trail ready for the last leg of our hike. The Toutle Trail was mostly level as it passed through the forest which was nice because we were all starting to feel tired. We pressed on and eventually reached the washout and the junction with the Blue Lake Trail and hustled the final 3/4 miles back to the car. I had chalked our fatigue up to the 10k we had all run the day before, as we seemed to have been much slower than normal. I got a possible answer to why when we got home and I checked the GPS which had us going a total of 16.1 miles :). I’m still not quite sure where the extra 2.6 miles came in but the track from the gps looks right so all I know to say is “Happy Trails”. Unexpected is as fitting a description as I can think of for our visit to the Trapper Creek Wilderness in Washington. The first unexpected event happened before we even arrived at the trail head. I have mentioned before that we seem to see more large wildlife from our car than we do on the trail. 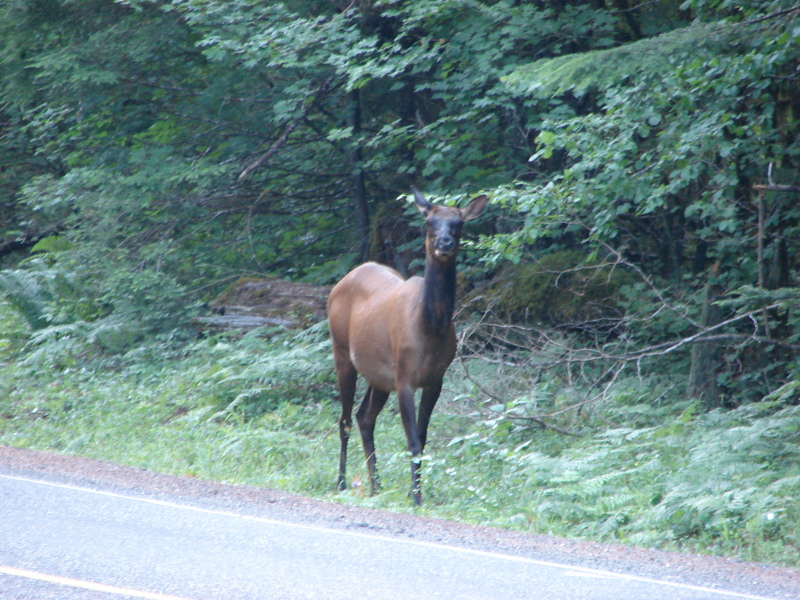 As we were turning off the highway I noticed a large brown animal just a bit further up along the shoulder. I quickly turned around and got out the camera. It was an Elk just grazing on the side of the road. 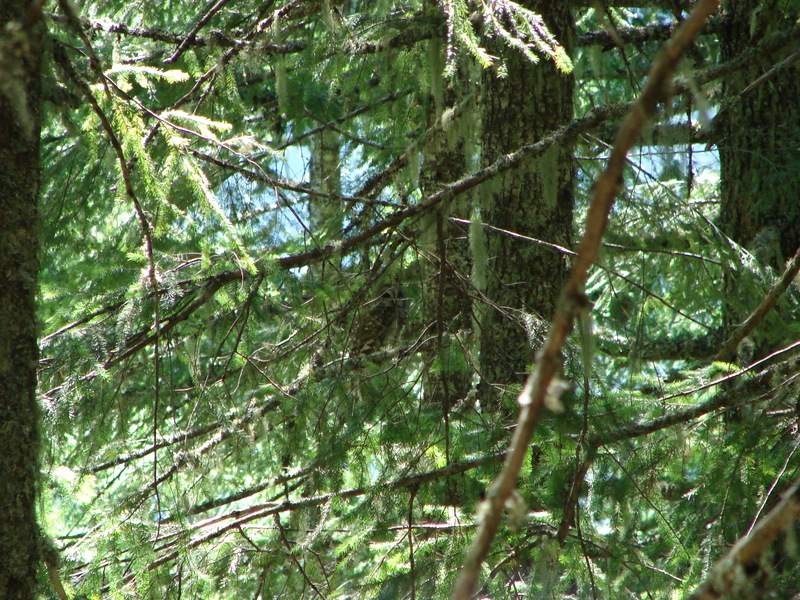 This was the closest we’ve been to seeing an elk on one of our hikes. We created the next unexpected event when we parked near Bubbling Mike Spring at an empty sign board. This turned out to be the wrong parking area, but the road ahead was gated closed and we failed to notice the small sign around the corner to our left that pointed toward the campground. We set off on a clear trail toward Trapper Creek which we knew we needed to cross at some point. That path quickly ended at the creek with no dry way to cross so we backtracked and headed up the gated road. We spotted one footbridge that had a do not use, danger sign posted on it as we passed several cabins that sat along the creek. The road veered away from the creek and just after crossing a small stream we decided to head back and work our way up the creek bank to see if we could find a crossing that way. No sooner had I recrossed the stream when I heard quite a commotion behind me. I expected to see Dominique on the ground since he is the most prone to losing his balance but instead it was Heather sitting in the middle of the stream. She banged her hand up pretty good but was fortunate not to have hit her head or hurt her legs. Her pinky though was already swelling and slightly discolored. We hadn’t even found the official trail yet and we had a “man down”. She decided she wanted to try and continue the hike so back we went to searching for a dry way across. After wandering up and down we settled on trying a downed tree that appeared to be flattened on top for crossing. It led to the back of a couple of cabins on the far side of the creek so we quickly ducked past them onto the access road that led to them. Our map showed that this road would lead to the trail we had been seeking so we headed left and soon had found it. 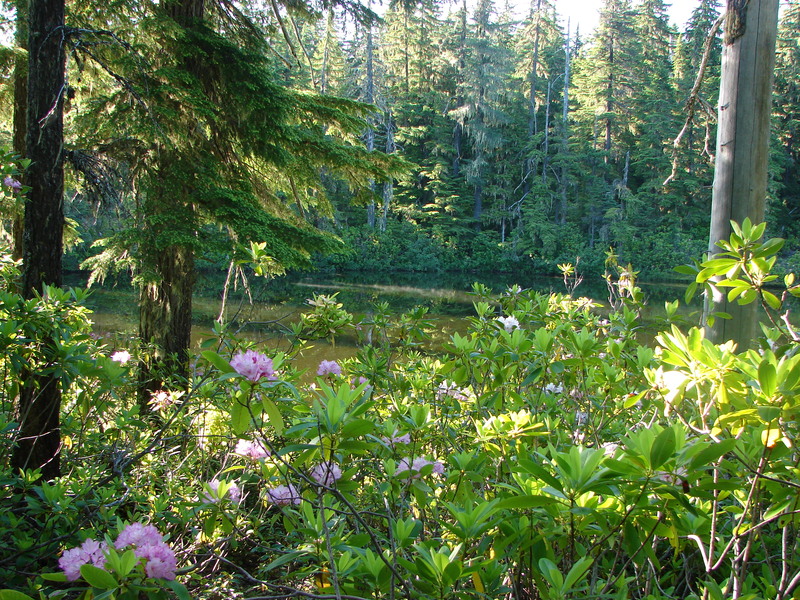 We entered the Trapper Creek Wilderness and paralleled Trapper Creek through a dense forest. 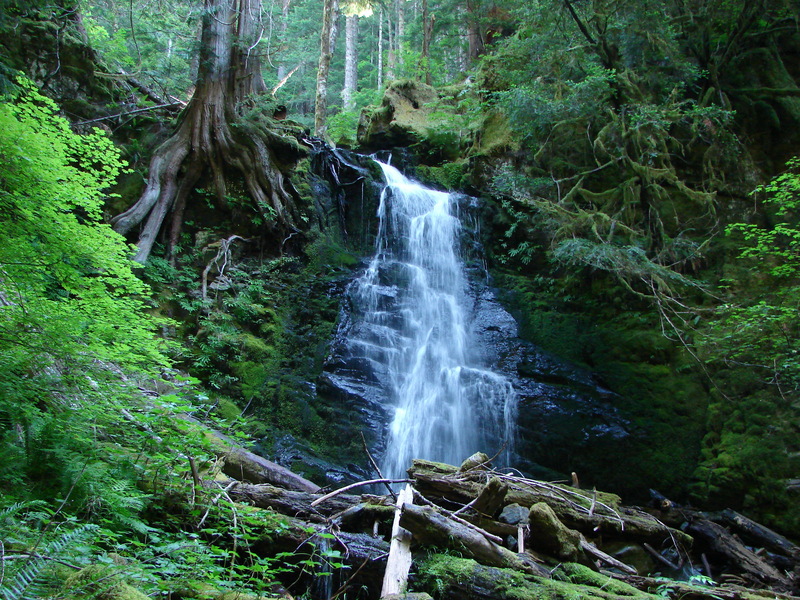 If you love old forests and the sound of flowing water this would be a great hike for you. If you are after views and wildflower meadows skip this trail and take the Observation Peak Trail from road 5800 as described in Sullivan’s 100 Hikes book. The trail went up and down occasionally offering glimpses of the creek below. After 2.5 miles the path crossed Hidden Creek and shortly after a pair of signs pointed to Hidden Falls. We decided we needed to check this out so we struck off on the faint trail up a ridge to a nice camping spot. Hidden Falls was below down a steep hillside which Heather and I picked our way down. We were able to make our way to the base of the secluded falls and then had to climb back out of the canyon. From Hidden Falls the Trapper Creek trail began to climb a long series of fairly steep switchbacks. We crossed the creek again after the first set of switchbacks and then launched upward again. A nice viewpoint along the way overlooked Trapper Creek Falls across the valley backed by Observation Peak. The trail eventually leveled out, recrossed Trapper Creek, and then came to a junction with a trail labeled “Shortcut Tr. 129B”. Dominique was all for taking any trail that had the word shortcut in it’s name so we turned up it. I don’t know how much of a shortcut it was, but we were soon at another junction, this time with the Observation Peak Trail. 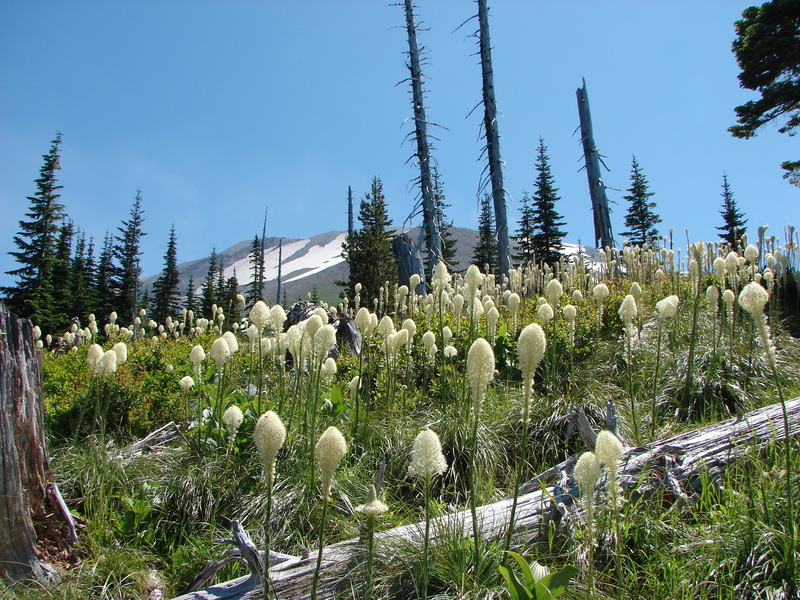 We headed up toward the summit through a forest with large bear grass plumes and many other smaller white flowers. After about a half mile of climbing we reached the lower viewpoint. This first viewpoint was on a rocky outcropping dotted with white cats ear blossoms. It had been a nice day, with blue sunny skies and a occassional breeze that kept it from being too warm but we found that clouds were hanging around the Washington peaks covering each of them to some degree. Never the less the view was impressive and the view from the actual summit promised to be even better. We returned to the trail and continued up another .2 miles to the summit passing bear grass blooms and other various wild flowers. As we approached the summit, Mt. Hood appeared over the right shoulder of Observation Peak with a faint Mt. Jefferson nearly hidden by haze further to the south. a couple of decent pictures. Our feet were sore and legs tired when we finally reached Trapper Creek and we didn’t care about finding a dry crossing. Our car was almost directly across from us so we just walked into the water and crossed. What was supposed to have been a 13.3 mile hike turned into a 15.8 adventure. Despite a few mosquitoes (much less than our last hike) and Heather’s bruised hand it had been a pretty good day. There was only one way to end a day like this – with pizza 🙂 Happy Trails. It’s July and that means mosquito season in the Cascades. We had our first real run in with the pests on our 4th of July hike at Salt Creek Falls. Through June I had seen only one mosquito which managed to get me on top of Salmon Butte. For the next month or so we will be faced with a dilemma, brave the hoards of bloodsuckers in order to see some of the best wildflower displays of the year, or play it safe and wait them out missing the best of the flowers. We chose to brave the danger (annoyance at the very least) for this waterfall hike. 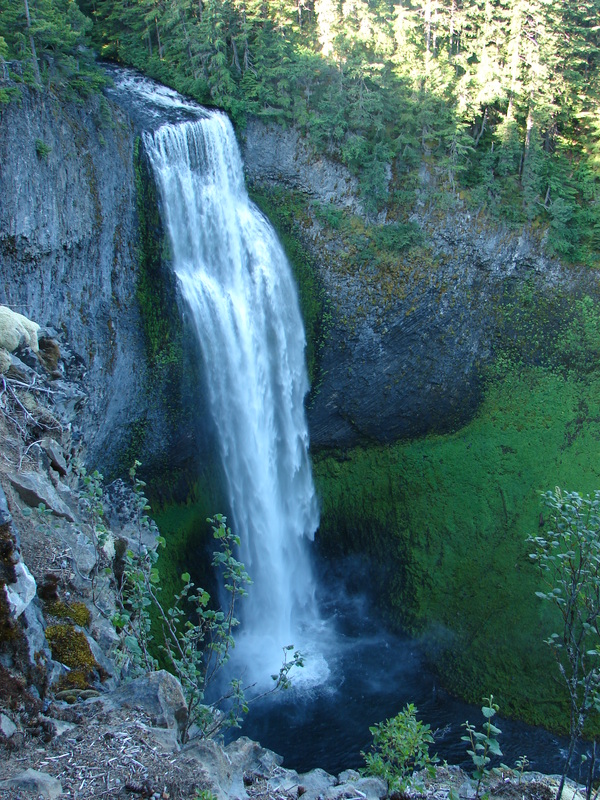 At 286′ Salt Creek Falls is Oregon’s second tallest and is conviniently close to Hwy 58 making it easy to make a quick stop. 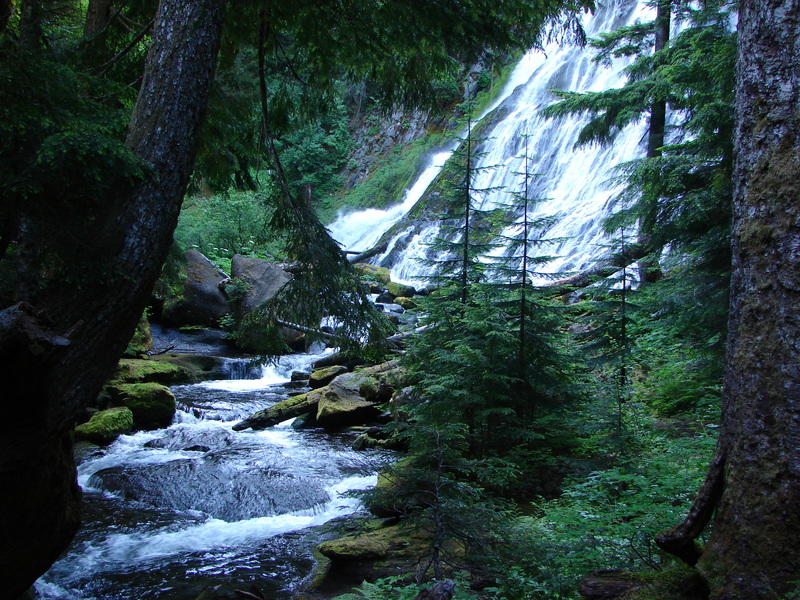 We tend to avoid quick and easy but trails leading past Salt Creek Falls head up into the Diamond Peak Wilderness passing a couple of lakes and two additional waterfalls giving us a good excuse for a visit. We were the first car in the parking lot and apparently the mosquitoes were waiting because I had one land on me almost immediately after I got out of the car. Luckily we had come prepared. We were all wearing long pants/sleeves and sported less than fashionable bug net hats. After a good dousing in DEET (a necessary evil) we headed down the short path to the Salt Creek Falls viewpoint. After viewing the falls we headed for the Vivian Lake which was 4 3/4mi away and our turnaround point. Shortly after crossing Salt Creek the trail split making a loop to Diamond Creek Falls possible. We headed right and soon came to Too Much Bear Lake. Despite the name we saw no sign of bears but the pretty lake was lined with blooming rhododendrons and reflecting the surrounding trees. As we continued toward Diamond Creek Falls several signs announced viewpoints. Perhaps we had been spoiled by the views on our last few hikes, but the view from these viewpoints was a bit of a let down. Diamond Creek Falls on the other hand was lovely. A short side path led down into a narrow canyon and across Diamond Creek on a footbridge. Not long after the crossing Diamond Creek Falls came into view through the trees. It was an impressively sized 100′ cascade that fanned out over the rocks as it fell into a cozy grotto. We returned to the main trail and continued past an upper viewpoint of Diamond Creek Falls to a second fork in the trail. The left fork would take us back to the parking area while the right continued on toward the wilderness and Vivian Lake. Before we made it to the wilderness we crossed Diamond Creek on a road bridge and passed over the Southern Pacific Railroad tracks. When we reached the sign board announcing the start of the Diamond Peak Wilderness we found that there were no self-serve entry permits left in the box, but there were plenty of mosquitoes buzzing around. The forest was full of white flowers, bunchberry, anemone, and queens-cup with an occasional beargrass thrown in. Many of the rhododendron were in bloom as well. The trail followed Fall Creek up to a viewpoint of Fall Creek Falls, a smaller 40′ cascade lined at the top with pink rhododendron blooms. The viewpoint proved a good place for a brief rest as it was an exposed rocky outcrop and almost devoid of mosquitoes. Another mile of climbing brought us to Vivian Lake but before we would reach the lake shore we had to cross a “meadow”. 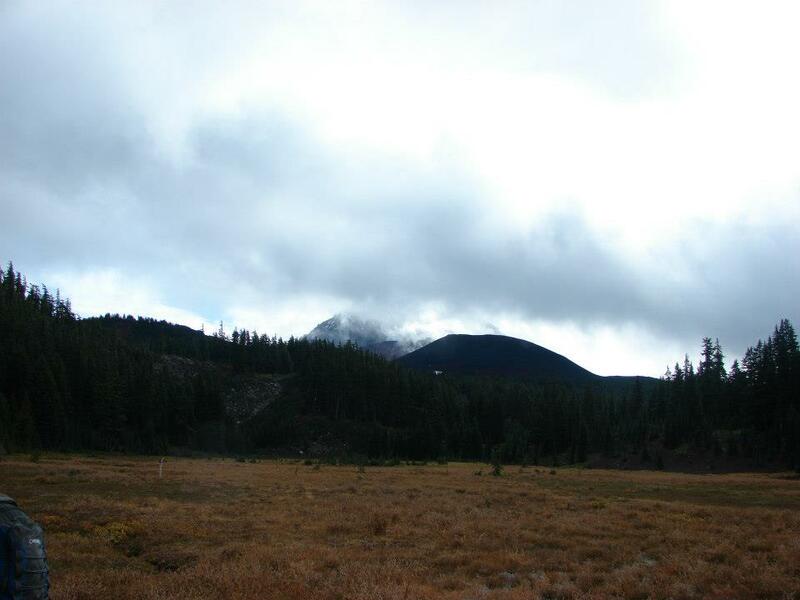 The meadow was still quite damp from recent snow melt but we did our best to stay on the driest part of the trail. Shooting star and heather blooms dotted the green meadow while frogs hopped toward the water where they joined tadpoles that had not yet emerged. Unfortunately it was also a perfect spot for mosquitoes and a large number of them swarmed the air just waiting for us to stop so we quickly made our way across to drier ground and followed the trail to the shore of Vivian Lake. We worked our way around the shore until we got a good view of the top of Mt. Yoran which reflected in the water. This would have been a wonderful spot for lunch if we hadn’t been on the menu. We stayed long enough to snap a couple pictures then headed back to the viewpoint above Fall Creek Falls where we had a better chance of a mosquito free lunch.